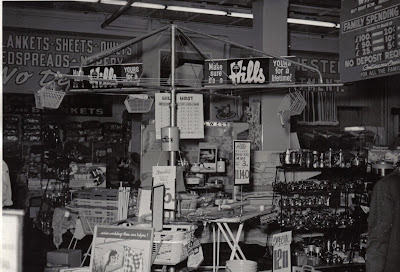 It was about 10 years ago now that I first clapped eyes on a mini hills hoist toy clothes line, c 1955. It was in the front window of a little antique shop long gone on Gamon Street, Seddon. I was completely and utterly enamored. It was in fair condition but the $350 price tag at the time was just a little out of my league…I mean what would a woman in her mid twenties with no children do with a mini clothesline? Really?! So – I just visited this gorgeous toy and took various friends and family to look at it until one day it wasn’t there anymore and I had a momentary feeling of regret. So as these things often play out – ever since then I have been on the lookout for one. 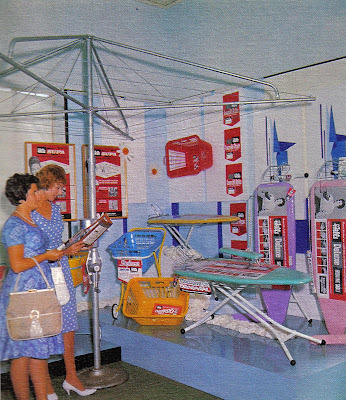 As I started to have stalls at craft markets and thought of using one as a display prop and then of course had children and was surrounded by a collection of all things ‘miniature’ namely mops, brooms, vacuum cleaners, washing machines and kitchen toys – the desire to ‘own’ a mini hills hoist became more tangible. 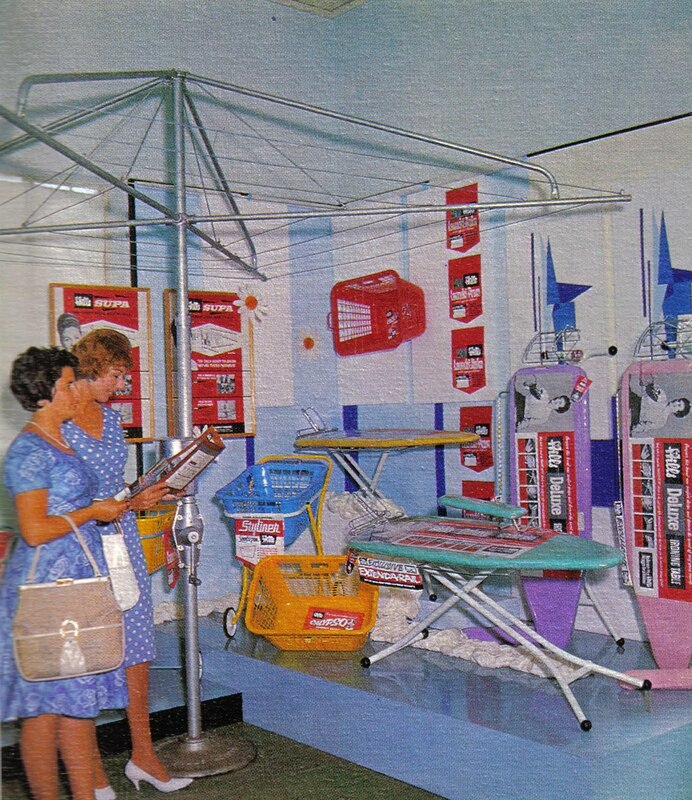 After a bit of research, I did discover a toy company in South Australia called ‘Orbit’ who made a similar replica of the rotary clothesline - slightly larger though and without the trademark winder of the hills hoist. I bought one of these and over the last 7 years it has been used and commented on countless times. Still it wasn’t the real deal as far as I was concerned and my hunt continued. Over the years I did find a few in my travels mainly on ebay. In various states most were quite weathered and had been left outside – unloved for many years. A number of times I put in a good go in terms of bidding but then stopped short when it got up to that $350 mark…I just couldn’t bring myself to pay hundreds of dollars for something that was a bit rusty and bent around the edges. The last time I missed out on one it ended up going for close to $500. I was astounded! Then – as always happens to those who wait (good things that is). I finally came across one in the USA, thanks to ebay. Still in its original box unopened I might add…..and with assorted pamphlets, brochures and photos. I couldn’t quite believe my luck. The postage quote was almost as much as the opening bid price but still if I could get it for the opening bid price – I was set to get a total bargain and brand new vintage at that! The provenance of this little gem was due to a man who had been a Hills Hoist salesman in the late 50’s early 60’s. He’d saved two of the mini ones unopened along with an assortment of papers for more than 50 years before on selling them to a man who opened and assembled one for himself and then put the other one on ebay. To cut a long story short – I won the auction at the opening bid price and finally my little mini clothesline was on its way to be with me! Yay!! 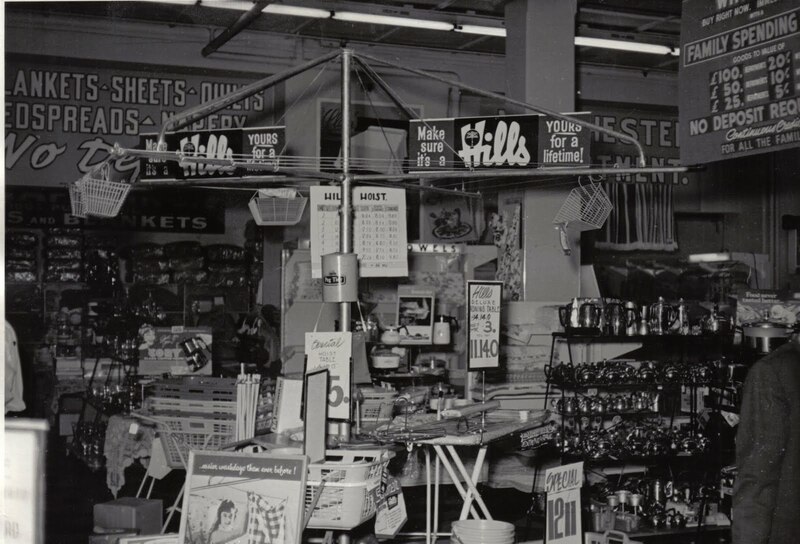 I have heard a few stories about why Hills made the small working model – apparently to begin with they were given to kindergartens as they wanted little girls to get used to hanging out the clothes! The other story goes that they were also used by door to door salesman as a demonstration aid when selling to housewives. The last 3 weeks I have checked the mail over and over again in anticipation…finally when my little beauty arrived – I was beside myself with excitement – opening the box was almost too much to bear - only because they say that once you open the box the value drops dramatically – but still the thought of setting her up on display in the Crafty Squirrel and being able to see her everyday was enough to get me to slice open that box. I feel such contentment……it’s been a long wait. Now I just want a giant wooden ruler……. All set up in The Crafty Squirrel! I think there is a book about the hoists-what a lovely story Morgan. I'll have to come in and check it out. That's rad! I have a real one that was in our backyard when we moved in. It was so beautiful and iconic I couldn't bare to throw it out, so it sit,s under the house until I sell it one day! It's a beauty...a real working one! I have a mini Hills Hoist no box but very good condition, i am 53 and have had it since i was a child. Didnt think they would be so sought after, wow pretty chuffed at that now. What a lovely story. I'm 55 and have had a miniature hills hoist since I was 3. My kids used to hang their dolls clothes on it. I can't bare to part with it, holds lovely memories of my parents who gave it to me. Maybe my future grandkids will play with it too! hi morgan.great story.I'm so glad you found one.I had one and yes I was one of those who sold theirs on ebay for you guessed $500.00.it was a great sale at the time but I have regretted it ever since,the woman was an artist in sydney who wanted to put little drawings with little pegs,much like your picture.I am allways on the lookout and if I ever find one I will keep it and post a few pictures.I believe the story about the salesmen demonstrator. I have my original one that I display my original 50s dolls clothes on. I also have my dolls washing machine and dolls and cane dolls pram. all are in good condition and have not been altered in any way. I still have my little kitchen cabinet with crockery! I'm 59 and adore the fact I still have them to enjoy. 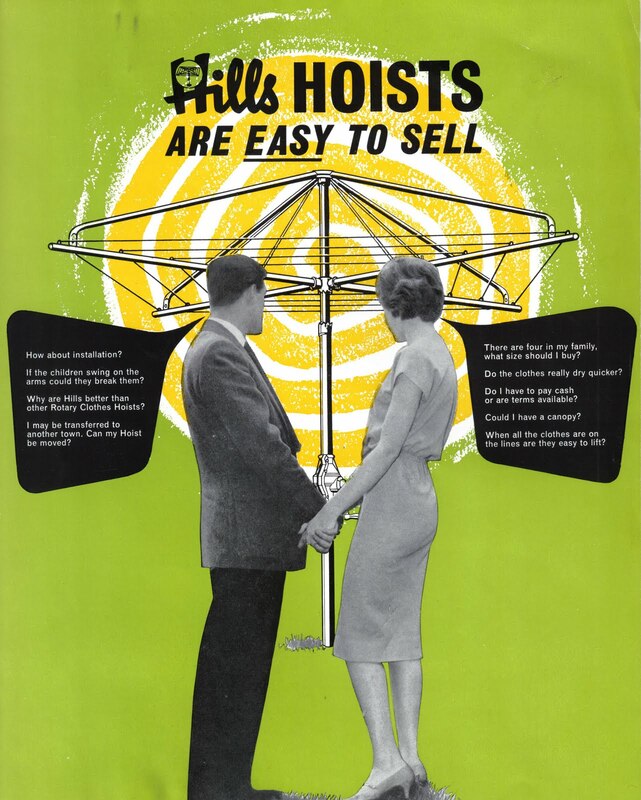 I, too, have yearned for a mini Hills Hoist after longingly eyeing off one in the yard of a hardware shop my father used to visit when I was little. Fifty odd years later, and after many unsuccessful ebay bids, I have finally realised my dream (though it is yet to arrive). I was thrilled to find this blog- neither of my older sisters even remember seeing it when we were young. I also collect dolls and toys, so there will be no shortage of uses for it! 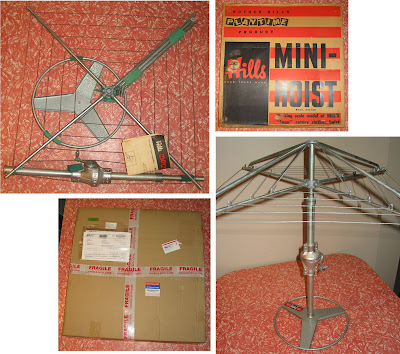 Still anybody interested in selling their mini hills hoist. Lovely story:) I too own one of these wonderful little clothes line. I have had the pleasure of owning this for over 50 years when it was given to me by my Aunty and Uncle for a birthday gift when I was just a little girl. It is still in great condition even after the use by my 3 boys when they were little. I hope one day to be able to see my grandchildren enjoy it too. This story is so charming, i'm selling one, please get in touch if you're keen to purchase. I'll be posting it on ebay once i take some photos of it. Hi do you still have your mini clothes line for sale if so how much and where are you located? Hi Just want to share this. For my 6th Birthday my Mum and Dad bought me my very own miniature Hills Hoist. I spent many many hours washing and hanging out my dolls clothes that I used to dress my cats in. I was the luckiest girl alive and played with my Hills Hoist everyday.Many years later I married and had a Son and Daughter of my own and handed down my Hills Hoist to my children who also played with it for many years. I am now 64 and cant wait for the day I become a Grandmother and of course my Grandkids will have many enjoyable hours with my special birthday present from all those years ago. Hi Morgan I would like to know where I can get one of the old mini hills Hoists from. I would love one for my shop. Regards Tess. Hi if anyone is looking to buy one of these I have one I am wanting to sell!